Laurel City Hall is located at 8103 Sandy Spring Road, Laurel, MD 20707; phone: 301-725-5300. Photo: Snow Hill, ca. 1800, Route 197, Laurel, MD. Home of Samuel Snowden, son of Richard Snowden. The Manor House was listed on the National Register of Historic Places in 1974. Photographed by User:Pubdog (own work), 2008, via Wikimedia Commons, accessed January, 2013. Identity as a place of human community traces back to early colonial beginnings. Arrowheads, stone hatchets and other artifacts uncovered in the district point to at least desultory Indian habitation long before the colonists. Human civilization has occupied the upper reaches of the Patuxent River in and around the site of modern Laurel for over 250 years. Charles I of England granted Cecil Calvert the charter establishing the Maryland Colony in 1632. The charter conferred upon Calvert almost complete control over the destinies of the colony subject to continued allegiance to the crown. In setting up his new colony, Calvert took for his model the existing social economic institutions of England, transferring from the Thames to the Potomac the seventeenth-century manorial system of the mother country. The first feudal manors created in the Maryland colony contained a minimum of 1,000 acres, but many were far larger. In all, about 500 large estates were established. The lords of the manors quite naturally became the colony's first governing class. The manorial plantations of Prince George's County, because of the particular characteristics of the soil and the availability of slave labor, were highly adaptable to the culture of the tobacco plant. The crop in short time became Maryland's chief product and Prince George's County became the colony's prime producer. In 1686 a manorial grant of 10,500 acres, spread over the four present counties of Anne Arundel, Prince George's, Howard, and Montgomery, was patented to Major Richard Snowden. The manor hall, Birmingham Manor, was built in 1690, two miles east of present-day. Laurel. An additional tract of 10,000 acres was granted to Major Snowden's grandson, Richard Snowden IV, in 1719. 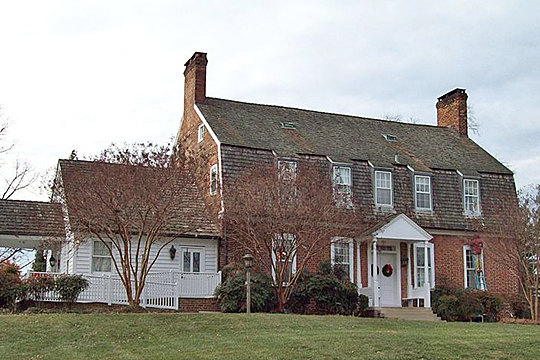 The Snowden's lovely manor home, Montpelier Manor, circa 1740, was built off the "Potomac Path," the early road linking Philadelphia with Mount Vernon and Virginia. By the late 1700s, with the gradual settlement of central Maryland, the problem of communication and transportation between towns had become pressing. An ambitious road-building program was instituted. In 1796 a private corporation, the Washington Turnpike Road Company, was chartered by the General Assembly to lay out and mark a public turnpike between Baltimore and Washington. By 1812 regular stagecoach service between the two cities was in operation. A "Half-Way House" was constructed where Laurel now is situated and this became a major stop on the route. In 1811 Nicholas Snowden erected a gristmill on the Patuxent River at the upper end of what has become Laurel's Main Street. The location was an excellent one; the river here spills down from the Piedmont Plateau several hundred feet in the course of a few miles as it enters the Coastal Plain. This fall-line site harnessed for the first time the Patuxent's considerable power. The enterprise prospered and the small nucleus of a town developed around the mill. In 1824 the mill was converted into a factory for spinning cotton yarns. As the town continued to grow, other small mills were founded along the Patuxent River. These mills manufactured such items as blankets, hats and iron products. One of these mills, the Diven Foundry, became well known through its manufacture of the ornamental ironwork for the conservatory of the White House. In 1835 the Patuxent Cotton Manufacturing Company was organized in the town. Financed by Baltimore capital, the company constructed a large stone mill, which utilized 600 throttle spindles and 300 looms, a sizable industrial operation for those days. The mill employed 500 workers. In the same year the Baltimore and Ohio Railroad began direct service between Washington and Baltimore, following the old stagecoach route; the expanding mill town became a major station of the new line. A second cotton mill, the Avondale Mill commonly known as Crabbs' Mill, was constructed about 1848 and specialized in lace products. The railroad and the river together constituted the basic factors impelling the community's early growth. The town was called 'Laurel Factory," acknowledging an initial debt for its existence to Snowden's mill as well as recognizing the importance of the local plant. In 1873 the name was officially shortened to simply "Laurel." Churches and schools were added as Laurel developed from a cluster of houses into a full-fledged industrial town. Saint Mary of the Mills Roman Catholic Church, Laurel's first school, the Old Stone Methodist Church and Saint Philip's Episcopal Church were built in the 1840s. When Samuel F. B. Morse transmitted in 1844 his historic message "What hath God wrought? ", this first communication over a commercial telegraph system passed along the wire from Washington to Baltimore via Laurel. The Civil War marked the end of the first epoch of Laurel's development. The war erupted on a community divided. The emancipation of the slaves and the eventual victory of the Union disrupted the old tobacco plantation economy of the surrounding region. The town's prominence in manufacturing was eventually eclipsed as the Industrial Revolution and advances in transportation after the war broke down regional barriers that formerly had shielded small-scale, less efficient production centers. Laurel's big cotton mill, which manufactured sailcloth, was itself doomed by the advent of the steamship; the mill finally closed about 1911. The decline of industry in Laurel, however, was gradual. Laurel was incorporated in 1870 and for the next two decades was administered by a board of five commissioners. In 1890, when the present Mayor and City Council form was adopted, Laurel's boundary stretched from the Patuxent River on the north to the vicinity of today's Montrose Avenue on the south, and from Walker Branch on the west to the present boundary on the east. In 1888 Laurel was the largest town in Prince George's County and the main station on the Baltimore and Ohio Railroad between Baltimore and Washington. The slow transformation of the local economy was by now well advanced. As the Nation's Capital continued to grow through the multiplication of Federal offices after the Civil War, more and more government employees moved into the Laurel area. At the same time, many old-time residents found jobs in Washington. Dislocated mechanics and mill hands from local industry found ready employment in Baltimore's thriving factories, and at the Naval Gun Factory and Government Printing Office in Washington. Some of the business and professional groups likewise gravitated to employment in Baltimore. For most of these daily commuters, the railroad offered fast and frequent service. At the turn of the century, Laurel's population stood at a stable 2,500. In the late 1890s, a series of fires in the town dramatized the need for a public water supply system; the system using Cull's Lake (Laurel Lake) as a source was completed in 1900. Commuter travel was given a big lift when in 1902 the Washington and Berwyn Electric Railroad was extended to Laurel, with fares much lower than the railroad. In 1911 the Maryland State Fair Association launched horse racing in the area on its long and successful career, offering races at the Laurel Race Track. Other tracks were subsequently opened at Bowie and Savage. The annual attraction of thousands of race-goers to the town during meet-time gave the local economy a solid boost. During World War I, Fort George G. Meade was established as a training camp at its present location. Other federal facilities seeking large tracts of land close to Washington also moved into the area, bringing jobs and business. The Department of Agriculture's Research Center at Beltsville was an especially important addition to the area's economic base. These new developments did much to break the sense of isolation brought on during the town's industrial decline. Laurel had received electric light service in the 1890s, but gas service was not extended to the community until 1929. During the 1920s the City added a new armory, a library building, a new consolidated elementary school, and a theater, among other new community facilities. Washington Boulevard through town (US 1) was widened during the depression of 1929. In 1951 a one-way northbound by-pass was constructed, converting the Boulevard to a southbound roadway and appreciably relieving traffic conditions. Laurel is on land once owned by Richard Snowden, an officer in Cromwell's army, who came to Maryland late in the 17th century. The Snowdens had extensive holdings and played an important part in the development of this entire section of country. The town apparently derives its name from the fact that mountain laurel in profusion covers the hill back of the town. In its early history, the town was known as Laurel Factory. High-grade iron ore was discovered on the Snowden tract, and the Patuxent Iron Ore Co. was formed in 1736 to exploit the find. In 1811 Nicholas Snowden erected a flour mill; previously, grain grown in the section was shipped by water to mills in nearby towns. The mill ceased operations in 1824. A brick house standing beside the old millrace is pointed out as Nicholas Snowden's Mansion. In 1887 David Weems conceived the idea of connecting the larger centers of the country with fast electric rail service. His original plans were for an electric line between Boston and Washington, passing through New York, Philadelphia, and Baltimore. Leading scientists in the field of electricity became interested in the idea, and at Laurel was constructed a circular track several miles in circumference, the superstructure of which carried an inverted overhead T-rail to serve as a trolley as well as a guide. The locomotive weighed three tons and had three axles, each serving as a shaft for a powerful motor. The drivers, 40 in. in diameter, were set to a 28-in. gage track, and were connected directly with the motors, no gears being used. Built exclusively for speed, it was more or less streamlined; the locomotive actually attained a speed of 120 miles per hour at the trials. The locomotive maintained this speed for 22 minutes, when the superstructure collapsed under the terrific strain; the huge steel bulk hurtled through the air for a distance of more than a hundred feet and was demolished. Proponents of the electrification scheme dropped the project because funds to continue the experiments were not available. At the eastern edge of Laurel, along the Patuxent River, have been found traces of an early Indian Settlement. Here are abandoned quarries that were worked long before the coming of the white man to this section. The quarries, from which was obtained stone especially adapted to the fashioning of cooking utensils and ornamental jugs, have yielded many fine products of Indian workmanship. In pits and in fields nearby have been found bits of pottery, arrowheads, and grooved axes. The fondness of these Indians for oysters is also plainly manifested by the presence of huge piles of oyster shells, uncovered in the course of digging operations. That the Indians who once inhabited this site knew how to extract copper from ore and work it is evidenced by the many pieces of crude plates, shields, and ornamental bangles found in the vicinity. City of Laurel, Master Plan, Comprehensive Amendment, 2009, www.cityoflaurel.org, accessed January, 2013.